These two friends were very supportive during a difficult time for me. I had no boyfriend – a new experience for me. I shared my deepest struggles with Val. She would give me a common sense answer She often tried to fix my problems. Bridgette was fun to be around. Things I never thought I would do, I did with her. And me – loyal to a fault. Together, I thought, we were a great team. Bellingrath Hall was located just across the road from the Memphis Zoo. For the longest time, I thought the monkeys were loud. The noise came from the peacocks. We didn’t go to the zoo. The zoo came to us. I saw a peacock once. It stood in the archways of Southwestern. The scene was beautiful. Someone told me that some student retrieved monkeys off of the roof of Palmer. The students were mountain climbers. I never tried to verify this information. It sounded reasonable. Off the subject of the real zoo, let’s jump into what was the sometimes colorful city of Memphis. At that time, Prince Mongo kept the town hopping. Val visited his house. She told of a monkey that flushed the commode. Once, the hottest topic at Southwestern – Prince Mongo landed his hot air balloon on the Southwestern football field. The city did not renovate Beale Steet until long after we left. 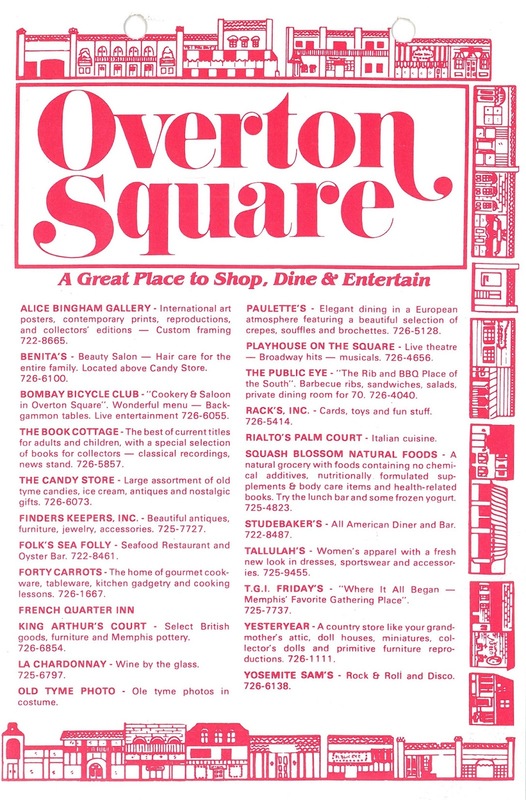 We spent a lot of time at Overton Square. At that time, the drinking age was eighteen. College students packed the bars and restaurants. We spent a lot of free time in the places on Overton Square. 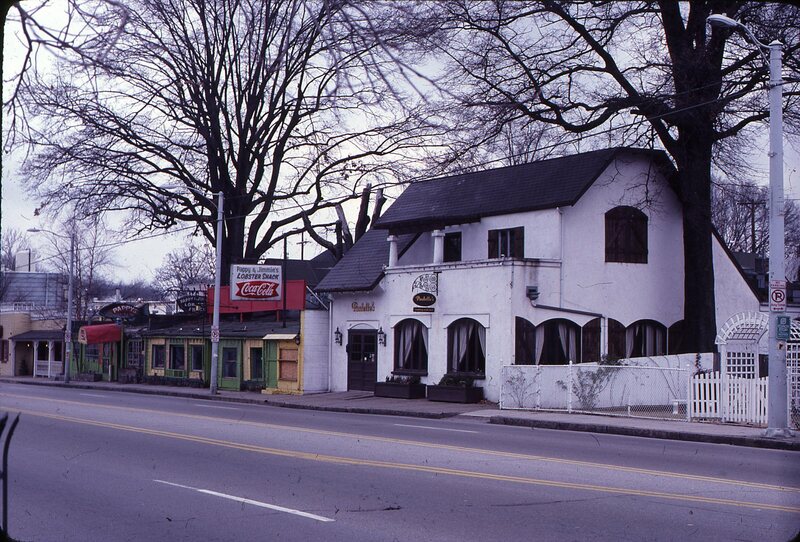 Places on The Square included T.G.I.Fridays, Solomon Alfred’s, the Public Eye, Bombay Bicycle Club, the Hot Air Balloon, Yosemite Sam’s, the original Huey’s, Silky Sullivan’s, and Paulette’s. The business list in this photo was probably after my time. Funeral Procession, August 18, 1977, on TV while at the dorm. On January 25, 1978, 2.4 inches of snow fell. Everything stops in Memphis when that much snow falls. The three of us became tired of dorm life. I never forgot that all of us walked over the bridge on Summer Avenue in the snow. Val, Bridgette, and I headed to a restaurant Summer. The restaurant had a small window. You had to press a buzzer to enter. We ate pizza, then left. At one time or another, each of us wanted to go home. Often, we didn’t want to go alone. One or more of us was usually willing to make the trip. It must have been 3 am one time when Bredgette decided we needed to go to New Orleans. Val – No. I don’t have time to get ready. Bridgette knew someone else that lived in Baton Rougeor was it Sheveport. Yes! With three of us driving, we got to Baton Rouge or maybe Shreveport in time for breakfast. Bridget’s friend’s mom made great omelets. We stayed for a short while. Then we were on our way. We were off to New Orleans. I can’t remember if we went around the bottom of Lake Pontchartrain that time or not. But I do know that the Lake Pontchartrain bridge has to be one of the longest I could remember. We got to Bridget’s house at a reasonable time. She lived in Metairie (Metry to the locals) I would later learn, it was a section of New Orleans (Nawlins to the locals). Bridgett’s mother was a caterer. Bon Appetit magazine covers covered one wall of her kitchen. Her dad was a builder. He built a house. They would live in it. Then he started on another house. Residential foundations in New Orleans require piles because of the water table. Their house was two stories with a swimming pool in the back. Learn more about building in New Orleans by reading The History of Building Elevation in New Orleans. Cemeteries in New Orleans are above ground because of the water table. We drove by one once and Bridgette exlained how most burials took place. She explained so many things that a regular guide might not know. All right, foodies, New Orleans is all about food, especially seafood – oysters, crawfish, and shrimp. Red beans and rice, jambalaya, gumbo, and po boys are all Louisianna basics. New Orleans pralines and beignets top the list of desserts (Cafe Du Monde). Famous drinks include the Hurricane. Discovering the place with someone from there, excited me We usually returned with loads of crawfish and one Bridget’s mom’s special salads.